Strawberries and Buttercups: Chocolate anyone! Just imagine if all 3 of us got her a tray each plus her other guests its a lot and will go to waste. I said to my sister we should get her instead a flower arrangement, chocolates and a fruit basket. My sister agreed but ended up getting two flower arrangements in the colours of her Mehndi dress and she was getting annoyed with me because I couldn't understand why we had to get 2! Isn't it weird to get 2 flowers arrangements in exactly the same colours but also the plan I had for the chocolates also meant that we'd end up with something also floral looking. In the end I didn't want anything to do with the flowers as my sister was being rude about the fact she didn't understand what my problem was. 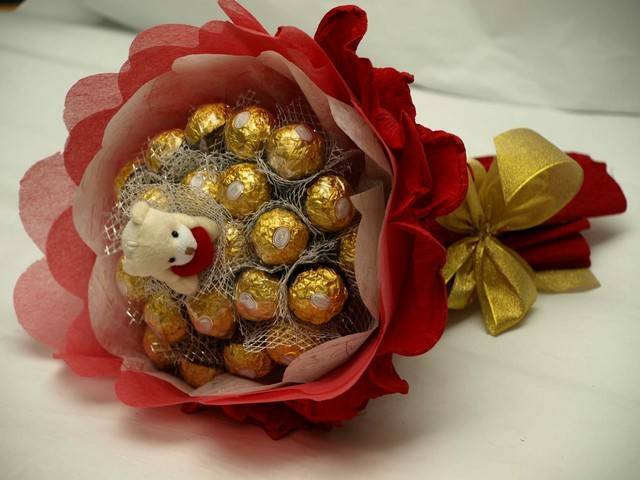 Anyway a couple of years ago I went to a Mehndi where someone turned up with a Ferreo Rocher arrangement and it looked fantastic that my sister and I were both starring at it, we can't remember thought what exactly it was. My sister couldn't remember it so did a search online and came up with trees but with having left it all so late the deadlines are for 3 weeks from now. We even asked at the flower arranging shop and that lady said she did them but because they didn't pre buy the Ferreo Rochers in advance and they weren't on offer at the moment it would work out really expensive. My younger brother came across someone on Facebook who did it at a decent price and lives in Bradford. We sent her a message but she hasn't got in touch and I really hope she does and makes us a really nice one. Ours won't quite be like this but doesn't it look amazing. They tend to have a different pot, especially clear ones with sweets in. When going to the flower arrangement shop she also told us that she could put them inside the flower arrangement too. Looking online I came across these that look so much more fun. I'm going in search of chocolate now. I'm guessing you will be too as these just look so yummy. I've also come to realise that maybe I could have a try making something similar myself. I'll have to have a look to see how they get the Ferrero Rochers to stay in. Hi there - they hot glue them onto sticks or in the case of the round ball onto a styrofoam ball. since it's in the outside of the paper it is easy. for the fluffy one with tissue they old a square of tissue diagonally and then wrap it around. I'm pretty sure there are tutorials around for it! Fingers crossed for your idea to be realised. I'll need the luck as I'm going to make it myself. Oh holy ferrero!!! They look amazing, make sure to make a picture and show us when you are finished! I hope it all turns out OK in the end with the gifts, damn sisters never listen!! The thing is it would take some effort to want to eat the sweets off the tree first... ok I may think about it for a moment but they look amazing. I will share the pictures if it works out as I bought a tree!